Many automation project requires S7 PLC communication. You can use S7 MPI ActiveX as a communication interface with it’s flexible structure in your projects. License owners can use this ActiveX without any limitation. For who will purchase License a change can be made at free or paid ActiveX code. .NET Framework 3.5 is used at S7 MPI ActiveX. ActiveX made by considering easily adding to the program and the easily meeting other probable needs. For this purpose some features that are not contained other ActiveXs like save project, fetch record added to ActiveX. Thus you can finish all operations about MPI communication in a couple minutes. Gets or sets the component’s MPI Network address. Following line assings component’s MPI Network Address value to “str” variable. 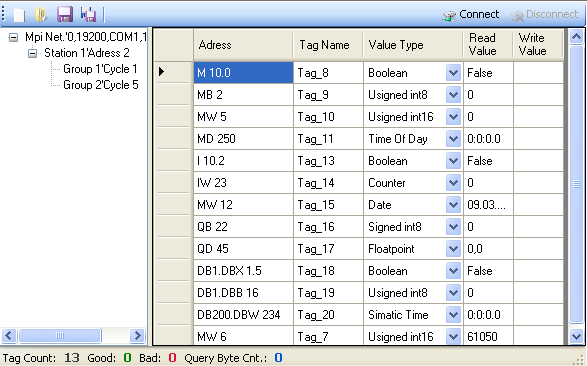 Following line sets component’s MPI Network Address property of the component. Gets or sets the component’s PC Baudrate. Following line assings PC Baudrate value to “str” variable. Following line sets PC Baudrate property of the component. Gets or sets the Com port that used by the component. Following line assings PC Com port value to “str” variable. Following line sets Com port property of the component. Following line assings Poll Interval value to “i” variable. Following line sets Poll time property of the component. Following line assings PLC Baudrate value to “str” variable. Following line sets PLC Baudrate property of the component. Gets or sets the PLC MPI Address. Following line sets the component’s connected address number. Following line Assigns component’s connected address to i variable. Imports existing Tag List to component If your application project contains more than one Mpi Component or there are another Tags in the project. Checks tag names for being unique with the component’s and given tags.